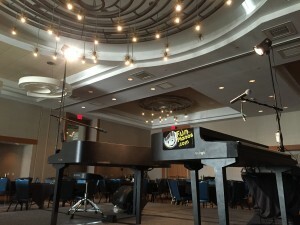 Dueling Pianos: Omaha has FUN Pianos again! We used Fun Pianos! for a client conference social event we hosted in April 2016. The show was a huge success, due in large part to the fact that the piano players are consummate pros and really know how to read a crowd. They were fantastic at interacting with the crowd and getting everyone – even those hesitant to participate – into it. We had a crowd of over 200 adults from all over the country with different tastes in music and entertainment, but the piano players drew from a variety of classic and fun songs to keep everyone entertained. They performed a high energy show with lots of humor and musical talent. Thank you so much! We LOVED having Fun Pianos dueling pianos at our wedding reception!! When I was originally thinking of hiring pianos to play, I came across the cost and simply could not afford it. I e-mailed Sam and we came up with something I could afford – 1.5 hours of dueling pianos at the end of thenight following the DJ – PERFECT! I could e-mail Sam, or Amy, anytime I wanted with questions I had and they would get right back to me with an answer every time. On our reception day, the pianos showed up a few hours beforehand to meet with our DJ in order to set up their layout together. The pianos rocked the reception at the end of the night, and we couldn’t have asked for a more perfect way to end our day. Trust me, it’s worth it – especially with Fun Pianos!! Thank you!! It went really, really well! Everyone had a blast and I got lots and lots of compliments – which never happens. Thank you for everything! AWESOME!!!! I have had so many wonderful comments about the show!!! It was fantastic! I gave their cards out to several folks that night. We will definitely be doing something like that again soon! 176 Keys Fun Pianos gave a great performance and did a fantastic job of encouraging audience participation. We enjoyed all of the songs and the singers’ wit. THANK YOU THANK YOU THANK YOU!!!! Wonderful entertainment – easy to work with – and just all around great fun for our customers and staff. Fun Pianos was great to work with and timely with everything. The party was a blast and everyone enjoyed themselves. I would highly recommend these guys as they are professionals in what they do and are truly the life of the party. I thought the players were very professional! They got the audience to participate, they interacted with us and it was the right amount of comedy and music. We want to hire them again next year. I only regret we couldn’t have them play longer. They knew what songs were appropriate and we have gotten nothing but good feedback from our employees. Thanks to all of you for everything! I thought it was fabulous! They were very “in tune” with the audience and it was very fun, on time, professional. The show was great! Sam and Whitney did a fabulous job. Thank you so much and we will definitely keep you folks in mind for future events. The show was great!! We have gotten fantastic feedback! 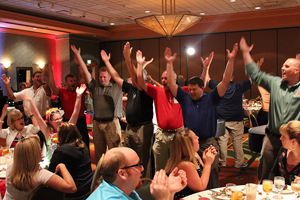 Our employees loved the interaction and letting them come up on stage! The guys were great and I hope they had a good time! The show went great! We have received FABULOUS feedback and the pianos really finished off what was a great conference. They were AWESOME!! I received so many compliments from the employees that attended the holiday party. It was one of the best parties we had and I knew Dueling Pianos would be a hit. I wanted to thank you all for helping me put on an excellent event the other night. Your players entertained YPO members last Sunday in Omaha, NE and were awesome!!!! They had a tough crowd and got everyone up and participating. Even my teen age kids (that I had to drag to the event kicking and screaming) had fun!!! I was so impressed!!! I am very happy I found 176 Keys. It went very well, especially for the small crowd [approximately 40 people]. The guys did a great job of engaging the crowd and where friendly and enthusiastic. Should another opportunity arise, I will get in touch with you! I just wanted to let you know that the guys were absolutely wonderful! I was told all night long it was the best Toast to Omaha event we’ve ever had… and most of the recognition goes to the fun entertainment! Thank you Thank you Thank you! I hope we can make arrangements to have the guys at next year’s event.